Genus: search for a particular genus. Checking the "Display when last updated" box will display when each record was last updated. Species: search for a particular species. Checking the "Display when last updated" box will display when each record was last updated. Author: list all of the species or genera that a particular author described. 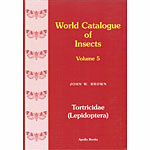 Type Locality: list all of the species from a particular type locality (country only at this time). Museum: list all of the species and genera with types located at a particular museum. List genera by Tribe: list all of the genera belonging to a tribe selected from the dropdown. List genera by Subfamily: list all of the genera belonging to a subfamily selected from the dropdown. Note that results from all of the searches return both senior names and junior synonyms. This is by design; however, it may inflate the number of actual matches displayed at the top of the page. The number of matches for any particular search should be checked manually before using this number in any publication, statistics, etc. The ability to display only senior names will be added in the near future. You can search on partial text matches in all fields. For instance entering "accu" in the genus field will return both ACCUMINEULIA and ACCUMINULIA.